Amazing Lazing Lilac, Tangerini Bikini, Cabana Banana, Pooltime Lime, Cool in the Pool, bottle is To Dive For Pink. Sun Streaked, Beachen Peachen, Ocean love Potion, Berry Tubular, Vio-Let's Surf, bottle is My Fave Wave. Strawberried in the Sand, Maliblue, Bikini Envy, Abalone Shell, Seagullible, bottle is Just Beachy. And, to contrast, some polish that is 3-free but is pretty much hell in a bottle, I'll explain why after the pic. Nocti NanoBrites. Kiss and Tell, Bikini, Swag, Nip Tuck, Flying Naked, bottle is TMI. Despite the great colors, these are honestly the worst nail polish I've ever used. Even though they are brand new, they are thick, goopy, stringy and impossible to apply. They bubble wildly even if you haven't shaken them. The picture was taken about a minute after application. A few minutes after that they bubbled so much that they were completely unwearable. Not only that, but they take ages to dry. Seche Vite caused a weird cloud to form when I used it on top of these. I used half a bottle of Flying Naked one day just trying to get it to look good. Between the bubbling, bad texture and weird Seche cloud, I gave up. So, sadly, I can't recommend these. I'm not saying I'd never wear them again- I'm just saying I have to be in a particularly brave mood. Some of my China Glaze collection. I could probably name the colors, but I am far, far too lazy for that. Now, if you'll excuse me, I'm in the middle of trying to build Aerith a better flower wagon. 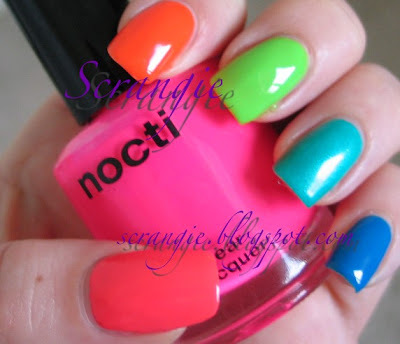 It's because Nocti is made by the same company that makes Zoya... you know how I feel about Zoya. lol. Omg! I love the summer splash and beach party collections. Sadly, I only have Bikini Envy out of all of those. Thanks for posting pics, we rarely get to see these old collections. And you're so lucky to have them all! You're welcome! 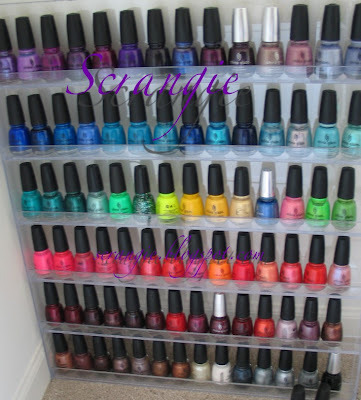 I really wish OPI would re-release some of the old colors! And nip tuck! *yum! * it's totally hawt. Oops, didn't mean to cause any panic :) Nip Tuck is a gorgeous color, I just wish it didn't bubble so much! OMG I love that shelf (or is it polish wall..) I have Ocean love potion too, but don't totally love that "unsmoothness" and it's sooo sheer : (. Beach party stuff looks fab, Maliblu is a bit of a lemming.. Lovely!! No problem that I can see....LOL! I am sure your stash is major huge. You never have (that I know of) told us how many you have, how you store them all, also when you go about purging the stash - or do you hold on to every bottle? Love to know more about your collection....even if you fear we will report you as a candidate for one of those Horder programs as a person needing serious help! Least you have space to organize your stash well it looks like though his was 08! I like in a tiny beach house that has 2 drawers in the kitchen (just to show how tiny it is). My stash is just taken over - no room for Helmers/Melmers. I would love to get rid of half of my things and set up a nice area for my 'works.' Also, I need to figure out now that I have a good database how I want to organize it all in the existing plastic shoe boxes that hold I think as of today it was count of 1543 bottles. I was going through your china glaze tags and wow, your collection is awesome. And I noticed that at the bottom you said you were building Aerith a better flower wagon? Lol you play?